I hope you've all been enjoying your Easter break, if you get one. We have had a lovely time and, as always seems to be the case at Easter, an awful lot of eating was involved. Time to get back on the wagon and as school is back today, time to get my head back into 'getting things done' mode. I don't know about you but to me sometimes the holidays feel like a waterslide. (Bear with me!) You go whooshing through them and they are great fun while they last but all too soon you are suddenly dumped out the other end feeling slightly disorientated and half drowned in a pool of water. Ok, so the 'pool of water' has to be changed to ' great big pile of jobs' for the analogy to work, but hopefully you can see what I'm saying here. I've had the fun, now it's time to tackle the jobs that have been building up and see if I can bob back up to the surface. 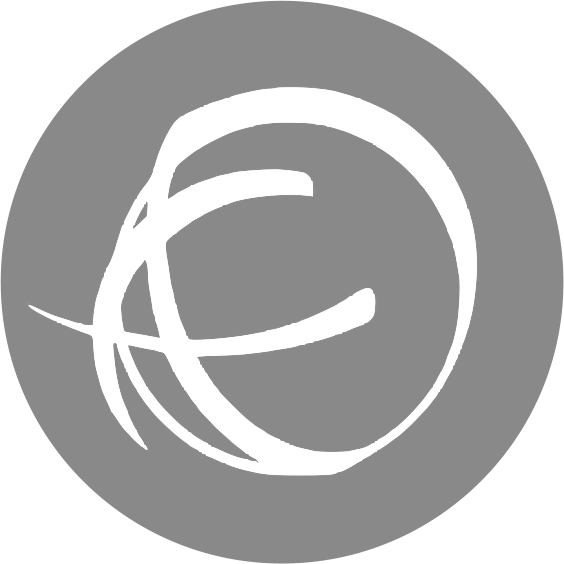 On which note, I'm here to announce that a little job I've been working on lately is about to be ticked off the to-do list. 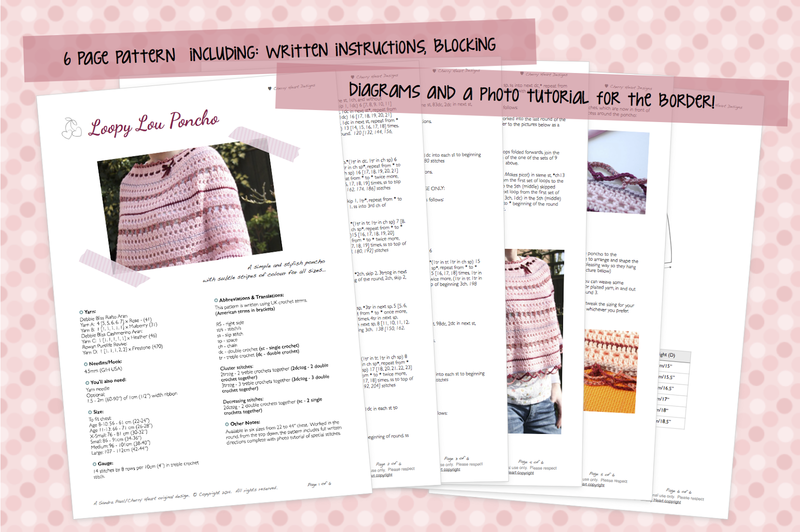 My Loopy Lou Poncho pattern. You might remember that I made a version for me back in March and then, because I wanted this poncho to be available in sizes, I made a version for Little Miss too. Well, my lovely testers have been busy (thank you so much if any of you happen to be reading!) and after a few adaptations and re-workings to tweak the numbers into line I have a pattern to share. As usual, I've tried to make everything nice and clear and easy to follow. 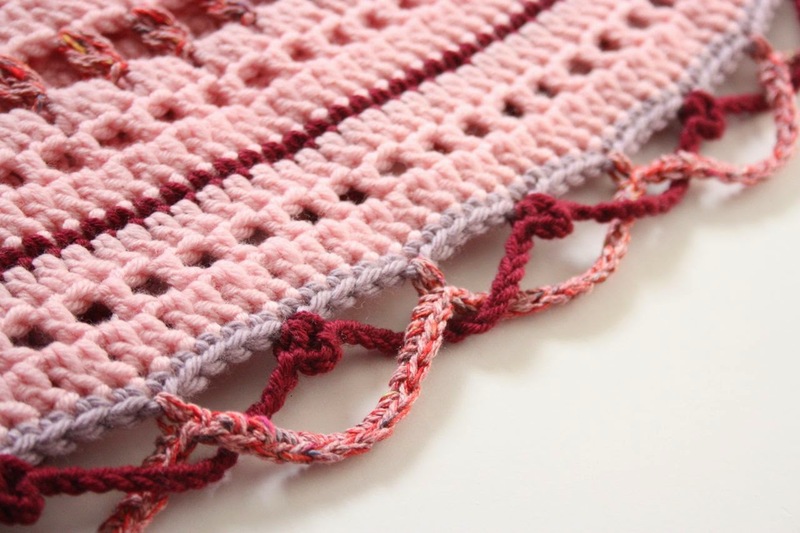 The pattern is in the form of written instructions, using UK terms and I've included extra information for deciphering stitches and a key to translate the terms to US crochet too. I've also included a photo tutorial for that bottom border, that I know you might worry about because it looks all complicated and intertwined. It's actually very simple though and the photos will walk you through step by step. This is my first pattern which includes different sizes too, six of them altogether. I've started with a little girl size, about 7 or 8 is the youngest I think it will fit. That's about a 20-22" chest size, then it goes up in increments to a womans size 44" chest. So hopefully you'll have everything you need for a snuggly poncho of your own. I'd love to hear how you got on, so if you'd like to share your projects please pop over to the Ravelry Group, Cherry Hearts Cozy Corner. It's also a great place to go if you have any pattern queries. Thanks for this !!! I have been waiting for the pattern and will definitely buy it. . . 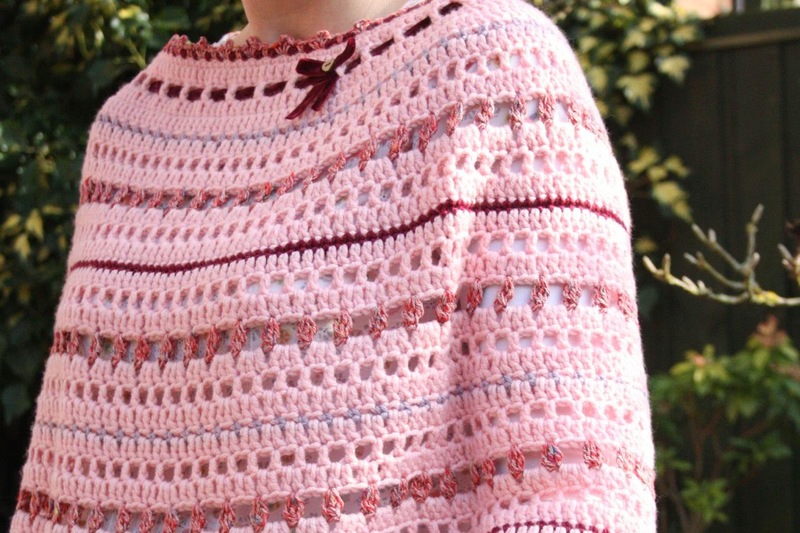 I will be making the poncho for my daughter. I gave her 2 poncho options and she chose yours !! to my delight as I also loved your more. . . Your poncho looks fabulous - Well done you on writing your own pattern. Very pretty poncho, in pretty colors. I am also considering buying your pattern and to make it for my niece. Please come and share this at my link-yourself monday. You're absolutely right, that's exactly what it's like. It takes a couple of days to get back to normal. It was a good ride while it lasted though. I love this poncho, beautiful and so practical. I've only just found your blog...just read "When is a shawl not a shawl"...the one with all the flowers on pale green background? It is gorgeous!!! Totally beautiful. I hope you have worn it. Thanks so much! I have been eagerly awaiting this pattern since you posted about it. Just purchased it....now what colours?